I went to one of those Christmas in July press days yesterday. Plenty of well-dressed ladies, canapes and nonchalant expressions. Being neither well-dressed nor seemingly able to contain my excitement when surrounded by makeup THAT’S NOT EVEN OUT YET! I felt a little out of place. I wasn’t even carrying a designer handbag. 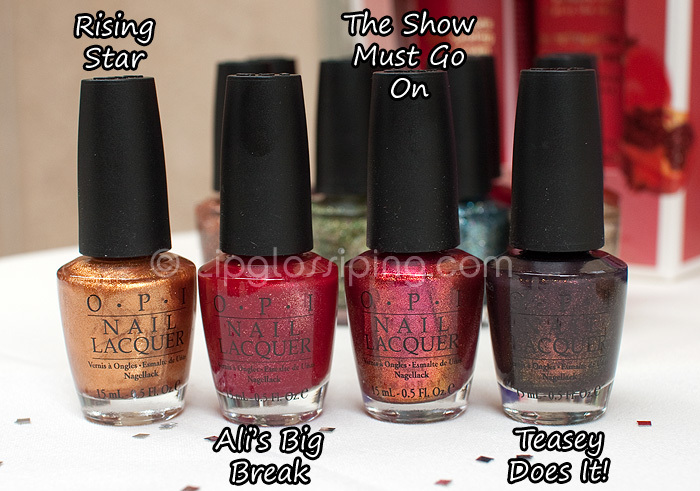 I may also have let out a little uncontrolled squeal when I saw the OPI Holiday 2010 Burlesque Collection due out at the end of November. Rising Star – Lustrous glimmering gold. Drool! Check out the duochrome shimmery goodness of Teasey Does It! and The Show Must Go On. Glitter-ama! These bear more than just a passing resemblance to the Alice in Wonderland glitters… I’m thinking OPI know a good thing when they see one. How perfect are these for Christmas? I KNOW it’s only August, and you’re a bit over the Xmas posts already. But how could I not show you these? I only wish I’d had the balls to swatch them all. But I think that perhaps sitting cross-legged on the floor painting each nail a different spangly colour would have been a step too far. Don’t think I wasn’t tempted though. You’ll be able to purchase the collection from LookFantastic.com – I’ve already earmarked a couple! Any of them calling your name? 12 colours. 20 nails. You betcha I’d have swatched them there and then. Not this IS a decent range. Forget the Swiss stuff. My only question is. WHICH ONES ARE LIMITED? Let me at ’em! Is sparkle-iscious the same as mad as a hatter? Sparkle-iscious looks like a revamped version of Mad as a Hatter… and that’s my favorite glitter polish. I have to get that one! yup – I agree, shoes off and swatching on the floor – where’s your commitment to the cause??? These are too beautiful to be true…can’t wait for them to come out! I’m really loving Ali’s Big Break, The Show Must Go On, Show It And Glow It, Simmer And Shimmer and Let Me Entertain You! OMG! Thank you SO much for the pictures! I want 9 LOL! I’m normally not a fan of glittery polish but teasy does it looks lovely. Not a single plain-arse creme? 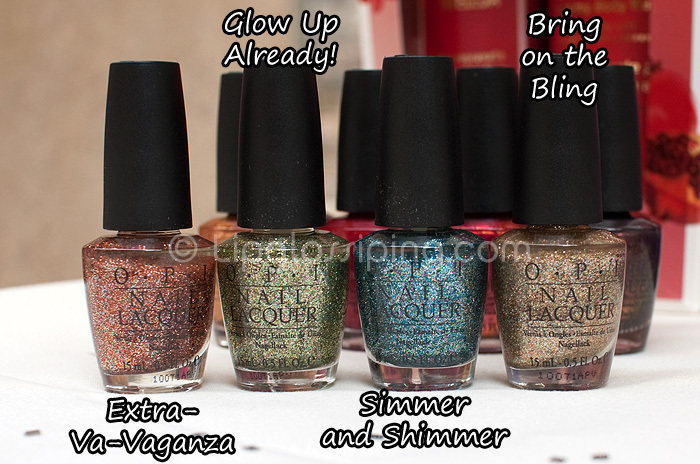 Come on OPI, throw us glitter-haters a bone! Where by “us” I suspect I only mean me. Am I the only one that is a little disappointed by these? I always look forward to the OPI Holiday release and usually end up buying most of them, but I’m only really loving 2 or 3 of these. Thanks so much for the sneak peek though! Awww, all of them, I’m afraid! Too bad they’re such a pain to remove. is ‘the show must go on’ holographic? it looks pretty cool! I only liked Teasy does it. I might get another one or two after seeing swatches, but OPI and I haven’t been liking each other lately. Too boring. There are a couple of maybes in there for me, but I’m much more desperate to get my mitts on the OPI Swiss 2010 Autumn Collection. There is a to die for teal shade, and a super cool silver, not to mention another lovely auberginey shade. Just stumbled upon your blog and I am so happy to see these bottles! I’m going to go get most of these for sure! Linked back to this post from my blog – these bottles are too pretty not to share! They’re all calling my name! The Show Must Go On is so gorgeous! I want it and I don’t even wear nail polish much as it chips off my nails in matter of hours. The Show Must Go On and Take the Stage are screaming my name. Teasy Does It Intrigues me as well. Nice to see some variety from OPI. I definitely need to pick up a few of these!! Especially since I missed Absolutely Alice! I am asking for help. In Italy it’s almost impossible to find OPI and China Glaze (or CND or thousands of other brands!!!) in shops. Can you suggest to me some internet site IN EUROPE where I can find these brands? I said “in Europe” because buying from USA is a pain due to custom for freight bureaucracy! Many shipped things easily get lost! You could try the China Glaze Facebook page. You can leave them a question and they often respond fairly quickly. One would think their people would know where one could buy their product! LOL, Good Luck! Thanks for posting pics! they look so much better than the promos released, I will definatly be picking up Sparkle-iscious (even though i already have Mad as a Hatter :P), Show it and Glow It and Teasey Does It! I am catching the VAPORS!! These colors are all soooo pretty! I can’t wait to get them! can someone PLEASE tell me if sparkle-icious is comparable to mad as a hatter? I want that, simmer and shimmer and show it and glow it. It’s clearly comparable… but I haven’t swatched any of the Burlesque collection. Sparkle looks much more gold then Hatter to me. Hatter is my all time favorite polish ever! These look beautiful! I’m excited for Bring on the Bling and possibly, Sparkle-icious. Thanks for taking the time to photograph these and when can we possibly expect some swatches? in the bottle, The show must go on looks like Bad Fairy from MAC’s Venomous Villains. hi there! love the photos, hate the promo pics. Colour inaccurate is an understatement for those! will be going for the glitters mostly, multi color glitter and the purple glitter look amazing. thanks for showing these so early! the multi color, the purple glitter and the fuchsia glimmer. Thanks so much for the sneak peek, I hope OPI does not give you trouble for posting this. I know a few bloggers took down their promo pics even (which are public anyway I guess?). thank you so much. i’ve been looking for this collection for ever. you can’t seen to find information about this. i will be surely buying something! Ohh, i have to say i saw the first photo and was bitterly disappointed, more foils! i was hoping for more alice in wonderland-esqe glitters… but once i scrolled down, oh those magical polishes stole my heart! so excited, I love show it and glow it, simmer and shimmer and glow up already. Can’t wait for this collection, I’ll be getting every one of those glitters! You can order these now on Amazon! Je¿eli planujesz zakup komputera stacjonarnego, laptopa, drukarki lub rozbudowê komputera warto odwiedziæ strony: http://www.zakupkomputera.comze.com , http://www.zakuplaptopa.comeze.com , http://drukarki.comze.com . Jest tam wiele ciekawych i przydatnych wiadomoœci pomog¹cych przy wyborze sprzêtu komputerowego. MakeUp4All Fall 2011 Online Beauty Mag is Live!